Born and raised in rural Japan, into a sake brewing family. 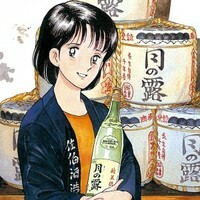 Formerly a copywriter at a firm in Tokyo, she has come back to her home to cultivate and brew the ultimate sake. Her brother was going to use a rare breed of "Tatsushiniki" rice, that is perfect for growing sake, but does not hold up well to chemical treatment. After his death from a long-time illness, she returns home and takes on his dream. She has a weakness for sake, and is often seen having drinking contests with her friends. Apparently, it is very easy to make her cry as well.